This is a post about gadgets and my relationship with them, spurred by my purchase of the latest gadget: an HTC Desire smartphone aka “Shiny”. I have a suspicious relationship with telephones, basically I consider talking to people at a distance a form of devilry and if you expect me to type messages in a 26 letter alphabet using a 12 key keyboard you’ve got another thing coming. Telephone use at SomeBeans Towers is simple: most nights Mrs SomeBeans rings her dad, once a week on Sunday my mum rings me, roughly once a month my dad rings me with a list of computer problems for solution and once every three weeks I ring Majestic to arrange wine delivery : “Simples”. All phone calls beyond this are a cause for chaos, consternation, confusion etc. I appreciate this makes us “anomalous” but I’m too old to care. 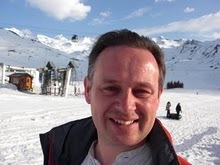 Mobile phone use is even more occasional, whilst skiing we sometimes arrange slope side meet-ups via mobile phone. Mrs SomeBeans was reduced to hysterics watching me typing a text message, moving my lips as I did it and eventually giving up because of cramp. When buying a house use of the devil’s mobile speech-horn is inevitable. At the start of the last house purchase I sat on the train with my mobile phone ringing from my pocket thinking: “Why isn’t that person answering their phone? It sounds an awful lot like mine (I think)”, on the previous house buying occasion I attempted to recharge my phone via it’s headphone socket, it died. My last trip to the phone shop was rather embarrassing for all concerned, I bought a Samsung E250 slider phone. I completely missed the point of the “slider” bit and asked the phone-geek whether it was a touch screen phone: “No, sir”. I expressed a desire for a phone embedded in an SLR camera lens, at which point the phone-geek claimed that the picture from some phone was as good as an SLR, so I like to think I wasn’t the only one to come away from the experience looking like a complete idiot. The Shiny was bought over the internet to avoid embarrassment. I did wonder about the touch screen aspects of the Shiny, I believe there a two types of people in the world: those that are happy to smear their horrible, greasy fingerprints across displays, and those that wish to kill them. I fall into the second group, so there was some risk I would have a touch-screen phone which I was psychologically incapable of touching. Fortunately this has turned out not to be the case, whilst transferring over numbers from the old Samsung I repeatedly tried to use the screen as a touch-screen, to the chagrin of all involved. 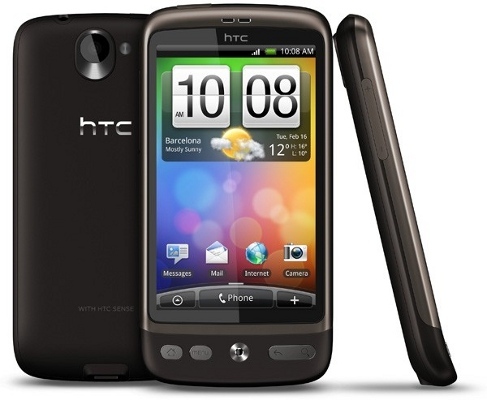 Why the HTC Desire? I do a bit of programming and the Android operating system on which it runs is relatively straightforward for me to program on (the iPhone requires you to use a Mac). Android has such magic software as Google Goggles which carries out picture based searching – it works too: it successfully recognised “Luncheon of the Boating Party” by Renoir on our wall, as well as a rather more obscure photo, and Tasty by Kelis (front or back cover). It has a radio too (you notice phone functionality is pretty much the last thing on my mind here). Chatting to friends of a more phone-friendly nature I got the impression that the Desire was the way to go. Blackberries looked a bit serious and business-like (and don’t have radios). 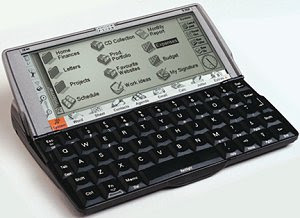 The predecessors of the Shiny are my Psion 5mx, a fabulous PDA with a lovely almost proper keyboard and built-in software which did not need to be supplemented, I gave it up after many years because the connector between screen an keyboard started to break regularly, I followed this with a Dell Axim x51v which I never really loved. My phone history is completely unmemorable, my first mobile phone looked like a toy bone for a dog, and made young people laugh. I’ve had two other phones since then but I scarcely used them. In other gadgets I got a bluetooth GPS to talk to my PDA so I could geotag my photos, then I got a Garmin GPS60 which did it rather more robustly. I joined the digital camera revolution rather early with a Kodak DC210, this was a revelation to me since previously my photography experience was limited to taking a few shots on film in a weeks holiday, finally filling a film after 18 months having completely forgotten where I was or what technically I had done to achieve the effect I had. After the Kodak I got an Olympus C750UZ, in parallel I also had a Casio Exilim S20 for it’s extreme compactness, then I went SLR picking up a Canon 300D from my father-in-law on which I became completely hooked, upgrading to a 400D shortly thereafter. The reason for going to the SLR was that even with a reasonably good point-and-shoot I was finding there were photos I knew I just couldn’t take because I couldn’t control the camera. An SLR gets round this problem by having a decent set of real controls, like a focus ring on the lenses, rather than some buried menu options and octopus-friendly button pressing. The thing with an SLR is that the camera body serves the function of a gateway drug, your dealer makes the real money on the lenses*. There’s probably a business model in giving away SLR camera bodies and making your profit solely on lenses and accessories. I’ve subsequently got a second Casio Exilim S10 to fill my dinky camera needs, this camera will take photos when people smile and claims that it can recognise different people and prioritise snapping according to your preference. This seems like a new way of offending friends and family, is making your wife anything other than top smiling priority grounds for divorce? 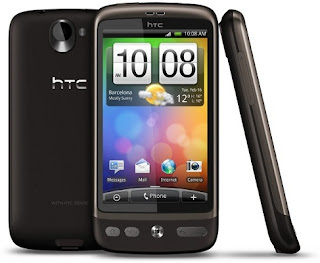 Returning to the HTC Desire: it’s fantastic! It can replace phone, pda, GPS and dinky camera: all in a beautiful package. The interface is a joy to use, wave your finger around on it and you go skittering off to different parts as if you’re skimming across the surface of a large desk. My old PDA felt like you were peering into a tiny fixed porthole on it’s innards. Tapping buttons on the screen gives you a touch of vibration feedback. Even the internet is pretty usable, as is the 200 page PDF manual. I have a bit of a mixed attitude to gadgets: things that are nice to use like the Psion, Canon 400D and Shiny, I really like. Things with crap interfaces, I can’t abide: programming video recorders and central heating systems I hate for their horribly kludgey 20 random keystrokes with no user feedback nastiness. And now, if you don’t mind, I will return to fondling Shiny. *For the camera fans I have the 10-22mm, 50mm f/1.8, 18-55mm kit, 28-135mm, 100mm macro, EF 70-300mm lenses. The 5MX was a beauty! The Desire looks great, it's basically the Google Nexus One 'Superphone' with the HTC Sense interface and a few minor hardware differences. I've got a HTC Hero at the moment which is a great phone, Android has so much flexibility that you can't really get with any of the other current smartphone operating systems. @Phil I've got as far as installing the development environment for Android and run the basic "Hello, World" program. A lot of API and UI wrangling to learn to get it to do something (unknown) useful, but it's fun!